These Halloween Jello Shots are super easy to whip up and will make a fun addition to your Halloween Party! If you’re looking for a BOOzy addition to this year’s Halloween party, Halloween Jello Shots are fun, festive, and can be easily made with ingredients of your choice! 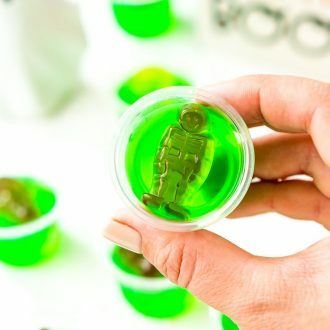 These vodka-infused jello bites are the utensil-free way to get a buzz and enjoy a sweet snack all at once! The best part is, you can use this basic recipe with any flavor of jello you want, plus a few ghoulish gummies to garnish the shots! This Halloween Jello Shots Recipe follows the standard steps for making regular jello shots, and they’re super easy! Simply pour the jello powder into a bowl, add boiling water and stir to dissolve, then pour in cold water and vodka. All you need is a few ingredients and a few minutes. Then, stick ‘em in the fridge, and your prep is done! 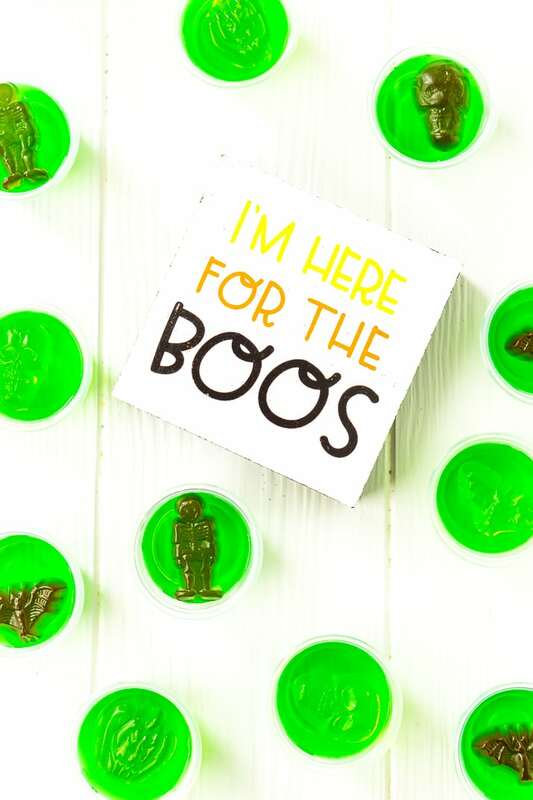 After the shots have set, top them with some spooky-looking candies, like gummies shaped like skulls, pumpkins, or bugs! Talk about a quick and easy way to get into the Halloween spirit! This depends on a few things such as the size of the shot and the temperature or your fridge. I usually make 1-ounce shots and they take about 2 hours to set in my fridge at 37 degrees F.
This is an awesome recipe to keep in mind if you’re hosting a holiday party and need a last minute addition to the table. 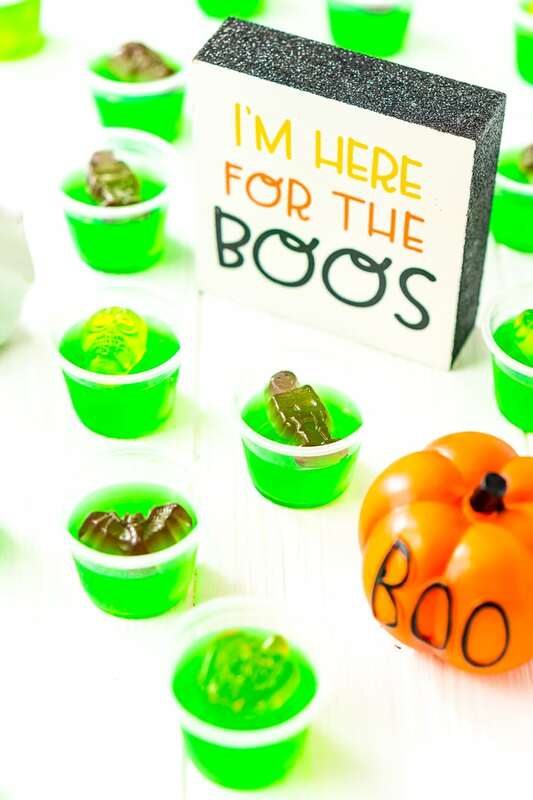 Or, if you’re headed to someone else’s house, consider bringing a batch of these Halloween Jello Shots to share! But don’t just save this vodka-laced treat for October. Whip up these wiggly wonders for birthdays, girls’ night get-togethers, New Years Eve parties, and more! If you can’t get enough of these fruity-flavored shots, there are plenty of other recipes, too! Homemade Sangria Jello Shots and Homemade Champagne Jello Shots are two more versions you have to try! Get festive, creative, and maybe even a little tipsy with these easy-to-make Halloween Jello Shots. Pick a flavor, a garnish, and some friends to share with, and you won’t regret it! 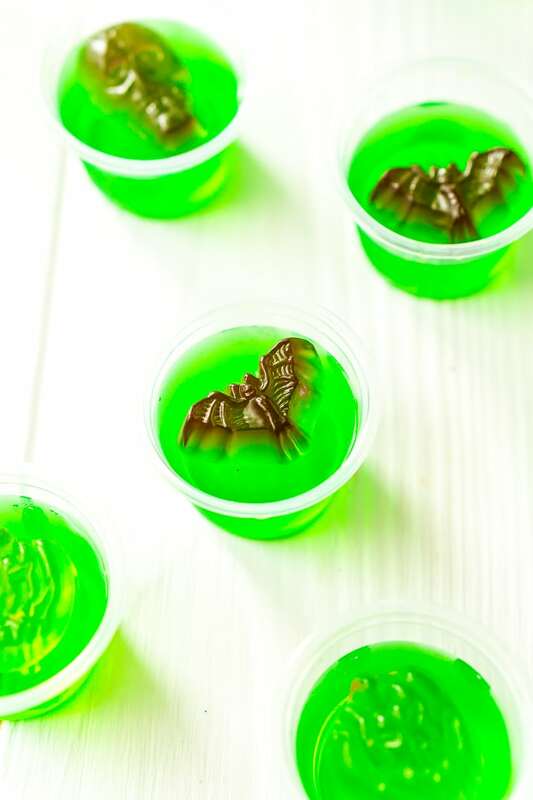 Pin these Halloween Jello Shots for Later! Empty the jello powder into a large mixing bowl and add the boiling water. Stir for two minutes or until the jello powder has completely dissolved. Stir in the 1/2 cup of cold water and 1/2 cup of vodka. Arrange 1 or 2 oz. cups on a baking sheet and fill them 3/4 of the way with the jello mixture. Place them in the fridge to set. 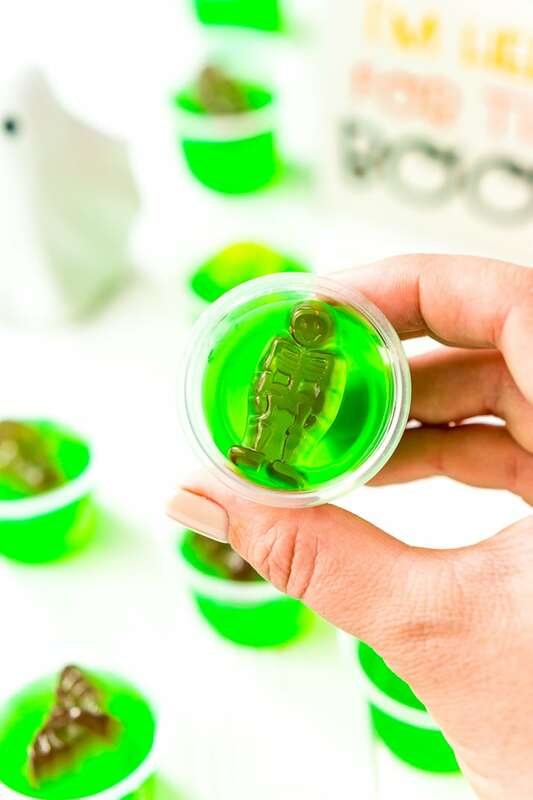 Add a Halloween gummy to each one after they set and top with a lid. You can use any flavor jello you'd like. Use a flavored vodka for even more fun.